Chestnuts Roasting in a Warm Oven…. This meal came the day after the snowpocalypse 2009. Ned and I were looking to eat healthily, like we always do on Sunday evening to try and make up for the weekend of chips and frozen pizzas! (snow food you see!) Ned has been on a big chestnut obsession for awhile, so we finally got some from Wegman’s and then took to roasting them! 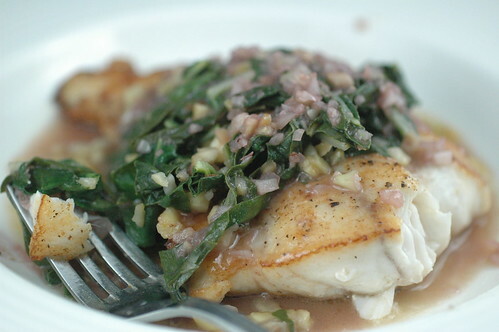 We paired the chestnuts with grouper, swiss chard, and a pomegranate vinaigrette. I used my new App on my pink iphone for the epicurious recipe search. I typed in seafood and winter and this recipe is what popped up in the search! 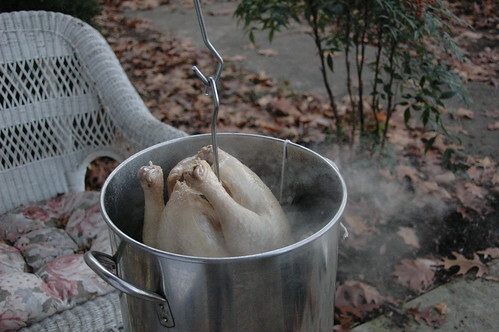 Continue Reading Chestnuts Roasting in a Warm Oven……. 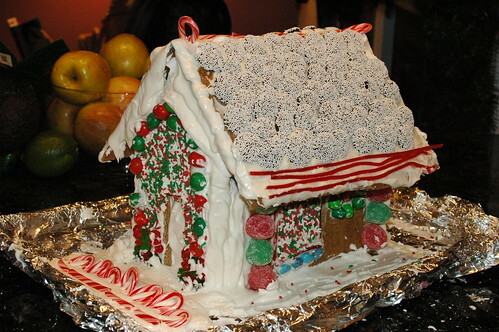 December Daring Baker’s Challenge: Gingerbread House! The dough making and rolling was actually quite easy- probably about 1.5 hours in total. Not bad if you want to be cheap and authentic when Christmas comes around! We went to Wegmans and got allll the christmas candy to decorate with. I think that was my favorite part- picking out the candy!! My not so favorite part was when the pieces of gingerbread started breaking apart which led me to Plan B, which Auntie Catherine so expertly assisted me with. Basically, I built another house out of cardboard and duct tape and then I royal frosted the gingerbread pieces to the cardboard house! 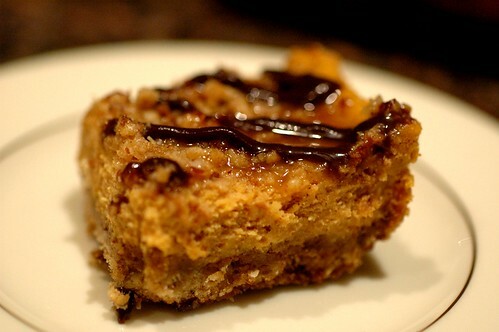 Check out the recipe below, some more pictures and the rest of my posse! 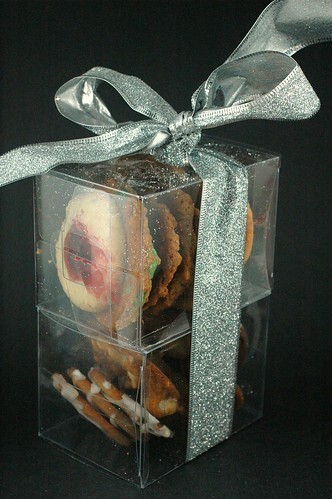 So I hope your Christmas day is full of fun presents, funny conversations and lots of cookies!!! When Martina, our new German friend, announced she would be having Ned’s lab unofficial Christmas party, I bounced onto the opportunity to make dessert! I went searching for something with fruit and something very wintery- and found this recipe from Smitten Kitchen. So on Friday night of the beginning of the Baltimore snowpocalypse I went to dinner with Jes at Taverna Corvino, a Federal Hill wine bar, and somehow (oh yes somehow…) ended up drinking quite a bit of wine! It was spread out over four hours and we had a lovely feast of small plates (sorry no blog post though- no camera!). So yes- this story will relate to cake! On Saturday, as the snow fell down hard and fast, my stomach was not happy with me. Neither was my head and because of that my cake making skills were severely lacking… BUT, I did have all of the ingredients ready, so dear sweet Neddy came to the cake rescue! He labored over this baby for about 2 hours and whattdayaknow?? It turned out amazingly! And the best part about this is that Ned is actually excited about baking now! Usually, he wears the chef hat and I’m the one with the strawberry apron and flour and sugar all over myself. 😀 But because of this baking challenge, Ned is no longer “scared” to venture into my domain and having this new cookbook is going to help (yay early xmas presents!). So anyways, about this cake- it was moist and gingery and appley. I have this weird thing with soggy pie crust and mushy apples, so apple pie is something I never crave-but this apple dessert- woweee! 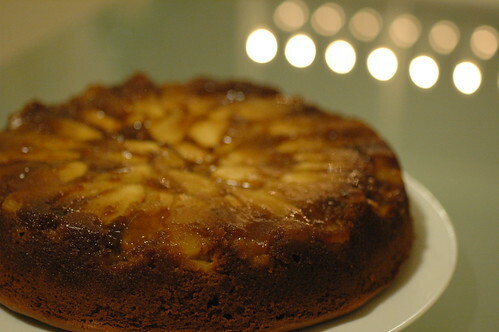 It’s basically a tarte tatin, but with a gingerbread cake instead of puff pastry! That Deb is a whiz- never lets me down! Go check out the recipe and some snowy pictures below. Our friends Ryan and Lea host a Griswald Family Christmas party ever year and the only requirement is that you wear an ugly Christmas sweater!!! I wanted to bring some funny appetizers, so I searched white trash party and the two creations below were included in that search! 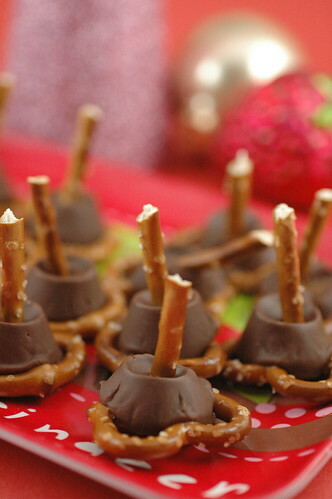 A circle pretzel was topped with a rolo, melted, and then a stick pretzel was inserted to make it easy to pop in your mouth! The second thing I made was fluffernutter sandwiches! See them and our blurry camera phone picture below! Well hello blog, a week and change has been too long… but alas I am back so thank gosh! So this month was hosted by Tracy– (first time!) and boy did we have a wonderful time! She has a huggggeee kitchen space with lots of space to spread out and another beautifully dressed table on which we could eat our creations! She is so thoughtful and lovely- I am so glad to have her in my life now! Here is a shot of our dessert that Alayne created! It was one of my favorites from the night. 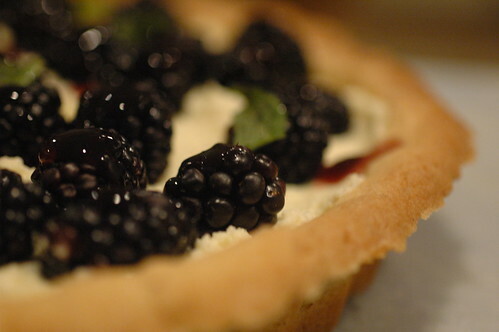 Loved the blackberries and the crust! Even though my roomate Jen and soon to be member of our family (CONGRATS BOBBY AND JEN!!! :-D) had Thanksgiving dinner at her house with her huge family, she was able to make it over for the dessert gathering at Auntie Martha’s house and she brought these!! So this year I had two thanksgiving dinners! The first was at my grandma’s house with most of my mom’s family and abuelita basically prepared everything and I got to do the waldorf salad. The second thanksgiving was prepared by my Daddy and I in my kitchen! We fried a turkey (hoooray) and made lots of delicious things including, roasted garlic mashed potatoes, herbed oyster stuffing, green bean casserole, leftover waldorf salad, canned cranberry and cannolis and pumpkin semifreddo for dessert! Lots and lots and lots of food!! Enough for leftovers for all of us + Ned for two solid nights! 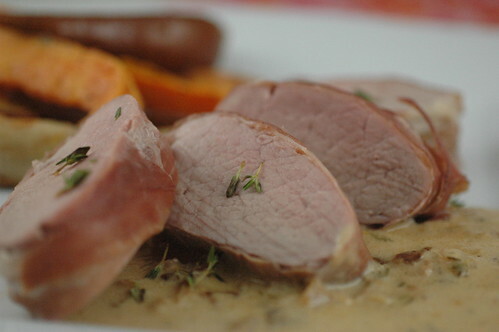 Well this was Round 1 of this meal and two out of the three things were better on this night than on Round 2 night, but one thing stood out- Real Simple’s simple way of cooking a pork tenderloin wrapped in prosciutto is too simple and kinda tasteless! They paired the tenderloin with roasted sweet potatoes and pears tossed with lots of fresh thyme and the side was the winner! When Ned saw how simple this recipe was he decided to make up a sauce with lots of dijon mustard, onions, garlic, thyme and some cream. It really helped with the flavor of the pork. And gosh- I love my creative chef! My palate would be so bored without it! Round 2 included a pan searing of the pork tenderloin followed by oven time and that was a much improved method to make the pig. My attempts to roast the remaining sweet potatoes and Ned’s second try to make that sauce again just didn’t match up to Round 1. It’s fun trying to improve or repeat dishes, really gets those chemistry and creative juices flowing… Go check out the simple recipes!